New York City is world-renowned for its innovative fine dining scene, showcasing the talents of top international chefs, bakers, and cocktail mixologists at venues throughout the city. These restaurants offer ambiance, creativity, and quintessential New York charm, perfect for a first lunch date or an intimate night out for dinner and drinks. The Ribbon is a Zagat-recommended and Michelin-starred Upper West Side restaurant that was the recipient of OpenTable’s 2018 Diner’s Choice Award. The restaurant is cultivated by brothers Bruce and Eric Bromberg, whose Blue Ribbon restaurants have been favorites throughout New York and Las Vegas since the 1990s. Its menu offers classic, refined American fare to please all tastes, including seafood dishes, craft burgers, and spit-roasted butcher’s plates. It occupies the former space of the historic 1920s Hotel Franconia and strives to embody the sophistication of the famed neighborhood in a refined dining experience. Brunch is served on weekend mornings, and an extensive whiskey bar offers international options. 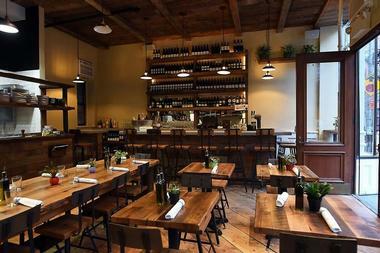 Hearth is an East Village favorite that serves sustainable, healthy Tuscan-American dishes crafted by chef Marco Canora. All of the restaurant’s fare prioritizes whole foods, utilizing the freshest meats and vegetables possible and focusing on healthy, natural fats such as virgin olive oil and grass-fed ghee. A full-table chef’s tasting menu is available at dinner, along with rustic dishes such as potato gnocchi, whole roasted fish, and grass-fed beef tartare. Full wine and cider menus are available, along with craft cocktails emphasizing fruit and herbal ingredients. On the weekends, the restaurant serves brunch beginning at 11:00am, offering healthy breakfast bowls, fruit-infused French toast, and bottomless mimosa and bloody mary options. Sadelle’s is an upscale Jewish brunch spot in the heart of SoHo, voted as one of the city’s best brunch restaurants by Harper’s Bazaar and Cosmopolitan. The restaurant is operated by Major Food Group and helmed by former Per Se baker Melissa Weller, translating traditional Ashkenazi Jewish favorites such as homemade bagels, sliced-to-order smoked fish, cheese blintzes, and egg and cheese sandwiches into gourmet fare. Sweet pastries include the restaurant’s signature chocolate babkas and sticky buns, the latter of which have been named as a top dish by The New York Times. Plates are large enough to share, making pricier menu items a viable option for dates on a budget and creating an intimate, inviting atmosphere. The Wren is one of the Bowery’s hottest spots, offering inventive pub fare and sophisticated drinks seven days a week in a rustic industrial atmosphere. Hearty dinner options include classic dishes such as pulled pork sandwiches, pan-roasted chicken breast, and fish and chips, with full cheese and snack boards and a wide variety of bar bites available. Draft and bottle beer offerings focus on wild ales and barrel-aged variants, while a craft cocktail list showcases drinks with Mexican-inspired flair. On weekends and holiday Mondays, a full brunch menu serves avocado toast, breakfast burgers, and shareable starters such as bourbon-infused churros. 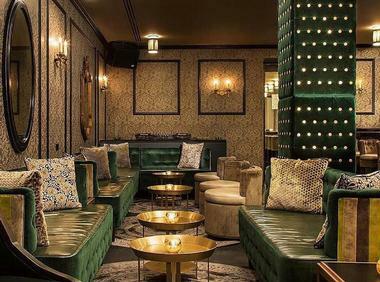 For couples looking to extend their dates, the bar is conveniently located near lower Manhattan attractions such as Washington Square Park, the Standard, and the Public Theater. Quality Eats is operated by high-end steak chain Smith and Wollensky, dubbed as “the future of the New York steakhouse” by Eater. The restaurant offers an affordable New American menu for brunch, lunch, and dinner, including top-quality open prairie Angus steaks, creative seafood dishes, and a raw bar with options such as tuna tartare and rock shrimp cocktail. Griddle options are available at brunch, along with internationally-influenced egg dishes such as mezze and eggs, spinach beignets Benedict, and chilaquiles. Classic and craft cocktails are served, along with a variety of wine and craft beer options. 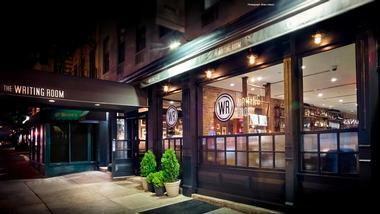 Locations are also offered in Nomad and the West Village. Ikinari Steak opened its first location in Tokyo in December of 2013 and has become an overnight success, offering more than 280 locations throughout Japan today. 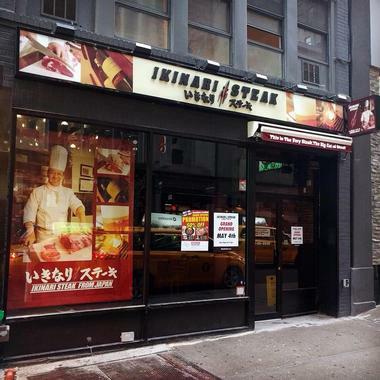 In 2017, proprietors Kunio Ichinose and Takashi Tsuchiyama opened the restaurant’s first location in the United States in New York City’s East Village and now operate eight locations throughout Manhattan, including restaurants in Hell’s Kitchen, Chelsea, Times Square, and the Upper East Side. The unique chain offers high-quality Angus steaks sold by the ounce, prepared to order and served with signature soy-based J-Steak sauce. Though its Japanese locations are known for their stand-up tables, which encourage quick-casual dining, limited seating is available at the East Village location for diners looking for more traditional, relaxed meals. The Spaniard is the latest project from chef PJ Calapa, known for his work at top Manhattan restaurants Nobu and Ai Fiori. The sleek gastropub opened in April of 2017, occupying the West Village space that formerly housed Oliver’s City Tavern, and is intended to evoke the atmosphere of traditional Irish public houses. Menus pay homage to classic Irish and New York fare, offering items such as spinach-topped oysters Rockefeller, steak tartare, and beef patty melts. 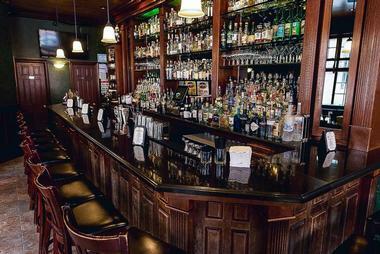 Over 100 scotches and whiskeys are stocked at the pub’s bar, with a cocktail list offered that highlights traditional favorites such as Penicillins and rosemary Manhattans. 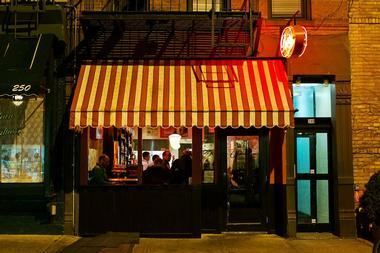 Daddy-O is a casual West Village neighborhood bar that is a favorite of many of the city’s professional celebrities and chefs, known for its superb burgers and craft cocktails. 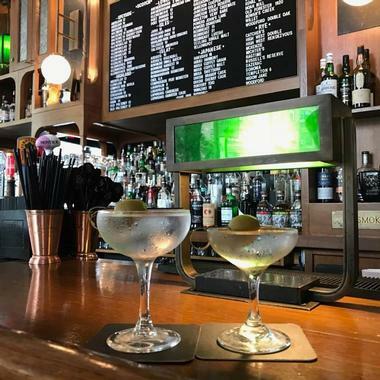 The bar has received international accolades from Time Out, Tales of the Cocktail, and The Sunday Times UK and has been featured on Food Network’s “The Best Thing I Ever Ate” for its pineapple and jalapeno-infused Herbaceous Mojito. Owner Phil Casaceli’s devotion to crafting unique drink concoctions is renowned throughout the city, with menus highlighting exclusive options such as the restaurant’s signature boozy root beer floats, private label reserve bourbon, and seasonal Butternuts Ale draft beer. An extensive whiskey and scotch list is also offered, along with international tequilas, rums, and vodkas. 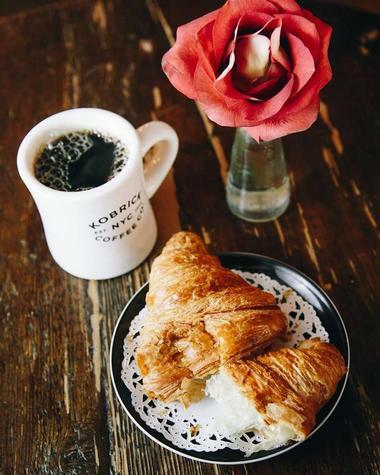 Kobrick Coffee Co. has been a New York institution for nearly a century, founded in the early 20th century by roaster Samuel Kobrick, who envisioned a product that would reproduce Manhattan’s effervescent energy in a brewed cup. Today, the company is helmed by third-generation Kobrick family members and continues to produce certified organic, fair trade, and kosher coffees that reflect their growing region’s individual character and flavor profile. A cafe in Chelsea is conveniently located near attractions such as the Whitney Museum of American Art and Chelsea Market, serving classic coffee shop beverages and coffee-infused cocktails, including a number of health-conscious options with ingredients such as coconut oil and green coffee extract. 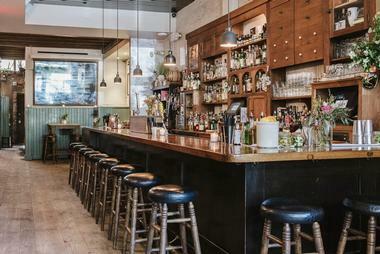 The Spotted Pig has been a West Village staple since 2004, known as a top spot for celebrity sightings. The European-style gastropub is helmed by executive chef April Bloomfield, recognized as one of Food and Wine magazine’s best new chefs in 2007, and was the recipient of the 2017 Outstanding Restaurant award from the James Beard Foundation. Classic pub fare takes cues from British and Italian cuisine, with dishes such as ricotta gnudi, roquefort-topped chargrilled burgers, and deviled eggs offered alongside an extensive wine list served by the glass or by the bottle. Visitors should note that the restaurant does not take reservations, seating patrons on a first-come, first-served basis, and may have extended waits during peak dining times. The Beatrice Inn is a traditional New York-style chophouse that began its life nearly a century ago as a Prohibition-era speakeasy. 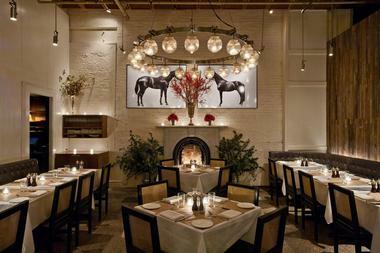 Throughout the 20th century, it went through incarnations as a family-owned Italian restaurant and an infamous early-2000s nightclub, though its reputation as an elite dining destination was not established until its 2013 takeover by executive chef Angie Mar, a former sous chef at the Spotted Pig. Since then, the restaurant has been lauded for its delectably elevated comfort food, including dry-aged burgers, milk-braised pork shoulders, and upscale dishes such as lamb tartare. 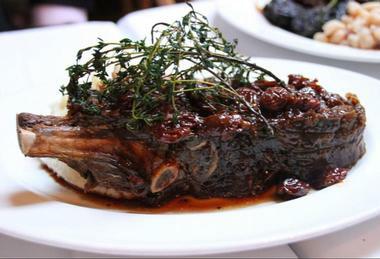 An extensive wine and cocktail list complements the restaurant’s meat-forward dishes, helping the restaurant to retain its original speakeasy vibe. St. Tropez is named for the famed French fishing village of the same name, offering Provençal-style cooking in the West Village space that formerly housed Café Minerva. The restaurant is helmed by executive chef Gérald Barthélémy, an alumnus of several Michelin-star Parisian ventures, and surrounds diners in farmhouse-style furnishings in an open-plan setting, with the restaurant’s kitchen visible from its seating area. Affordable menu offerings include classic French dishes such as duck confit shepherd’s pie, stuffed tomatoes, and beef meatballs with ratatouille, along with extensive charcuterie and oyster platter options. An all-French wine list offers more than 40 varieties from top wine growing regions to complement meals. Mulberry and Vine is a health-conscious chain that offers several locations throughout Manhattan and Brooklyn, including restaurants in TriBeCa, NoMad, and Dumbo. The chain was opened by health and fitness aficionados Michelle Gauthier and Genevieve Lynch and offers create-your-own bowls with ingredient choices such as roasted salmon, sesame scallion tofu, jackfruit, and charred avocado. All entrees exclusively use healthy oils such as cold-pressed extra virgin olive oil, making the casual-chic restaurant perfect for dates looking for more nutritious lunch fare. Prepared foods are also available, including kale, lentil, and quinoa salads and hot entrees such as curried freekah with cauliflower, mango, and cashews. Blackbarn Restaurant is a farm-to-table restaurant in NoMad by executive chef Matteo Bergamini, a revamp of his former SD26 restaurant that occupied the same space. 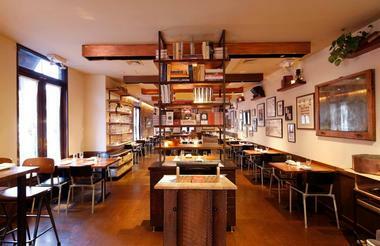 The restaurant’s redesign by co-owner Mark Zeff emphasizes whitewashed barn board-style walls, crisscrossed ceiling beams, and steel paneling to create a modern farmhouse atmosphere for serving Italian-influenced New American fare such as black fig pizzas, grilled corn salad, and porchetta with broccoli rabe. Two full dining rooms are offered at the multi-level restaurant, which boasts dramatic views of nearby Madison Square Park. 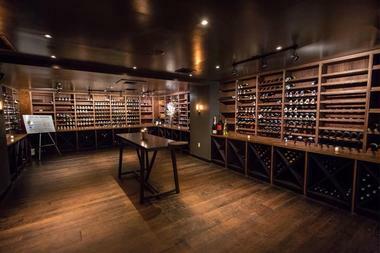 An extensive wine and champagne list is available, along with a small oyster bar. 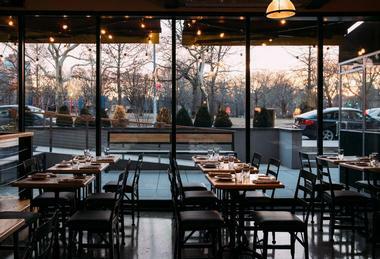 Annicka is the first new restaurant to open under Governor Andrew Cuomo’s farm brewery initiative, operated by small-batch brewers Greenpoint Beer and Ale. The Brooklyn restaurant doubles as a coffee bar during the morning hours, serving light breakfast, lunch, and pastries, and a modern farm-to-table restaurant at night, offering dishes prepared in partnership with North Brooklyn Farms such as grass-fed steak, dandelion greens, and fried mushrooms with coconut milk, accompanied by the restaurant’s house-baked sourdough bread. Staple Greenpoint brews are tapped, including favorites such as the brewery’s That Dry-Hopped Lager, Wet Jeans Cream Ale, Shindig Pale Ale, and lactose-brewed Milk and Honey American Blonde. Craft cocktails emphasize herbal ingredients, and an extensive wine and cider menu is also available. The Rickey is the craft cocktail bar and lounge of the Dream Midtown boutique hotel, the latest offering by renowned mixologist and bar proprietor Johnny Swet. The bar’s name pays homage to Washington, D.C. lobbyist Colonel Joe Rickey, whose affinity for lime-infused bourbon led to the creation of the famed Gin Rickey cocktail. An elevated menu of classic and creative cocktails is served, including elevated takes on standbys such as Manhattans, martinis, and Negronis. 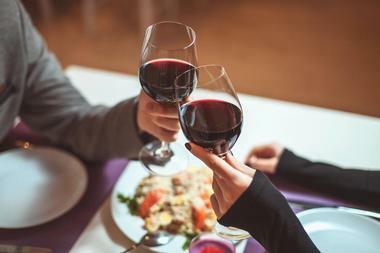 An extensive wine and liquor menu is also available, along with several local favorite draft beers and a light bites menu by executive chef Michael Armstrong. 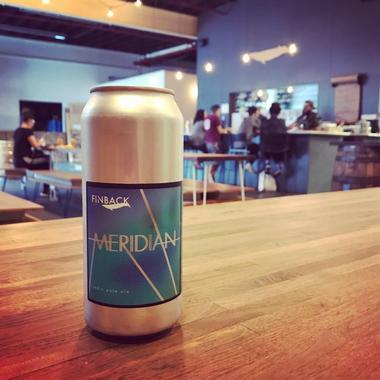 Finback Brewery was founded in 2011 and operates a 20-barrel brewhouse and tasting room in Glendale, Queens. The brewery aims to craft artisanal small-batch ales emphasizing flavor and complexity, from hoppy ales and smoky roasted brews to highly-sippable session beers and everything in between. Though no year-round flagship ales are offered, past favorites have included beers such as the brewery’s Starchild sour ale, Stumptown-infused Dark Entity pumpkin coffee porter, and Lazy Ax imperial stout, a collaboration with Brooklyn chocolatiers Raaka. The brewery’s tasting room is open to the public Wednesdays through Sundays and offers convenient indoor bike parking for dates looking to explore nearby neighborhoods such as Forest Hills and Middle Village. The Writing Room was originally opened in the 1970s and earned a reputation as a smoky, atmospheric Upper East Side staple for screenwriters, celebrities, and New York elites. After the original business closed its doors in 2011, it was purchased by the proprietors of Parlor Steak and Fish and reopened as a 130-seat restaurant showcasing a zinc-lined bar and a seasonal outdoor terrace. The restaurant serves New American favorites at brunch, lunch, and dinner and offers raw bar and steakhouse favorites, along with a variety of charcuterie boards and seafood and poultry entrees. Its extensive cultivated wine list aims to educate diners on grape varietals, while its literary-inspired decor pays homage to the many famous authors who frequented the original business. 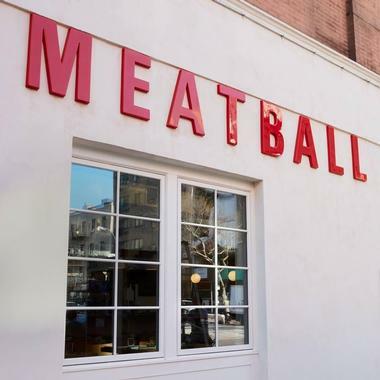 The Meatball Shop is a concept counter-service restaurant founded by owners Michael Chernow and Daniel Holzman, offering a create-your-own-meal menu centered around five types of housemade meatballs served with a wide variety of classic and innovative sauces. 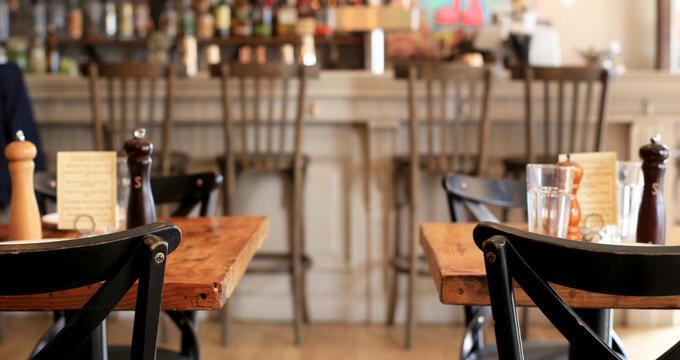 The casual, lively restaurant offers five locations throughout Manhattan and Brooklyn, including locations in the Upper East and West Sides, Chelsea, the West Village, and on Williamsburg’s hip Bedford Avenue. It is committed to sustainable business practices, working with farm-to-table butchers Heritage Foods USA. Shareable pitchers of beer are offered, along with a full weekend brunch menu at the Upper East Side location, featuring unique items such as smash-bun French toast and a “balls, biscuits, and gravy” platter. 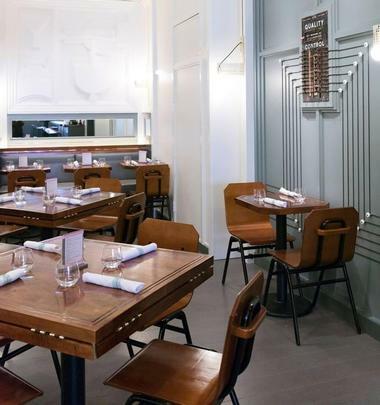 Parm recreates classic Italian-American dishes in a casual environment that evokes the atmosphere of mid-century American diners, complete with a short-order counter and throwback AM radio music. The restaurant was founded by chefs Mario Carbone and Rich Torrisi, students of famed celebrity chefs such as Mario Batali and Wylie Dufresne. Moderately-priced entrees include Saratoga club sandwiches, baked clams, and the restaurant’s eponymous chicken and eggplant parmesan platters, which are complemented by snacks such as giardinia pickles and pizza knots. Wines are available by the bottle or by the glass, and classic beer favorites such as McSorley’s and Schaefer are available on draft and in cans. Harlem Shake is an acclaimed Central Harlem fast-casual diner that has been proclaimed as the neighborhood’s answer to Shake Shack by Forbes magazine. 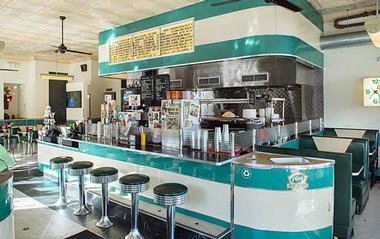 Its custom-blend burger patties, all-beef hot dogs, and hand-spun Blue Marble milkshakes have been named among the best in New York by major publications such as The Village Voice, Thrillist, and New York Daily News. A wide selection of beer and wine is offered to complement its classic diner menu, including eight taps of local draft beer favorites. The restaurant’s interior is cultivated to reflect the culture and community of Harlem, featuring a Wall of Fame with autographed headshots of notable African-American celebrities such as Maya Angelou and Janelle Monae. 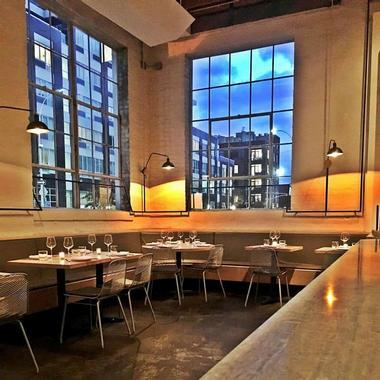 Lilia is the newest venture by A Voce and Spiaggia executive chef Missy Robbins, housed within a renovated automobile body shop in Williamsburg. The classic Italian restaurant emphasizes warm hospitality and homestyle Italian cooking, offering a menu full of handcrafted pasta dishes decked out with rich, fresh ingredients such as tender meats, sheep’s milk ricotta, and soft dried tomatoes. Notable entrees include wood-fired seafood options, gnocchi with pistachio-broccoli pesto, papparedelle with veal Bolognese, and a wide variety of vegetable-forward antipasto dishes. Classic Italian cocktails and desserts such as olive oil cake are also available. During the morning and afternoon hours, the restaurant also offers an authentic Italian-style caffe, serving espresso drinks and light fare. Saxon + Parole is the latest offering from Brad Farmerie and the AvroKO Hospitality GRoup, known for their British-Asian fusion cuisine at ventures such as Double Crown. The restaurant is named for two famed 19th-century race horses and strives to evoke the elegance of equestrian-slanted men’s clubs, decorated with rustic design elements such as a wagon wheel chandelier. 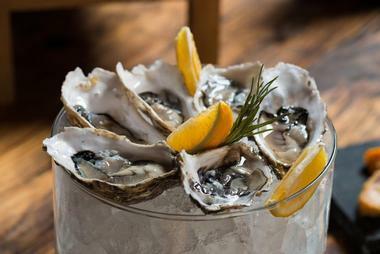 Meat-centric entrees such as burgers, steaks, and whole seafood choices are complemented by traditional appetizers such as oysters, shrimp cocktail, and charcuterie plates. 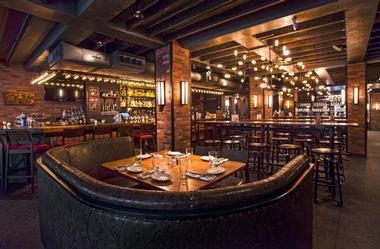 Downstairs, a lounge-style dining area offers a wall of whiskey offerings, with an extensive global wine list and craft cocktails also available. 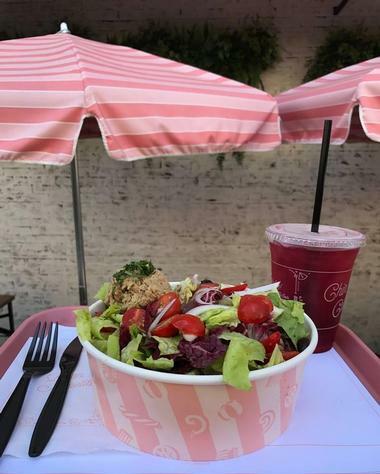 The Sosta is a trendy, casual Italian restaurant in New York City’s NoLIta neighborhood, operated by Samantha Wasser, the proprietor of popular health-conscious fast-casual restaurant by CHLOE. Its name, which means “break” in Italian, reflects its commitment to creating an inviting, playful environment for diners to relax from the hustle and bustle of Manhattan life. Fresh, seasonally inspired fare is crafted by chef Ali LaRaia, including house-made signature pastas and zucchini noodle dishes, handcrafted sandwiches, and antipasti boards. A curated menu of wines and beers are tapped, along with exclusive espressos and coffees from Devocion Coffee, and cookies and gelato from the East Village’s Fresco Gelateria are served daily. On the weekends, a full brunch menu is available, including breakfast pastas, granola bowls, and seasonal egg dishes. Loi Estiatorio is the vision of acclaimed chef Maria Loi, the official ambassador of Greek gastronomy for the Chef’s Club of Greece and the author of bestselling diet plan The Greek Diet. The restaurant is operated by the Greek Hospitality Group and strives to embody the Greek philosophy of philotimo, which encourages approaching accomplishments with a sense of pride in and respect for one’s community. 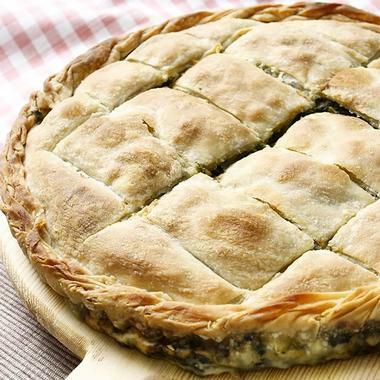 The Manhattan restaurant abides by Loi’s culinary philosophies and showcases a menu full of fresh, nutritious Greek fare, highlighting traditional entrees such as stuffed eggplant, spinach pies, and Greek-style lasagna. 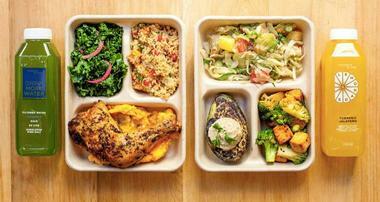 Lunch is served on weekdays, with dinner service available Mondays through Saturdays. Kobrick Coffee Co., Photo: Kobrick Coffee Co.